Available in different colors and shapes. Most popular tile profiles: Spanish, roman, shakes, or flat tiles. Red, brown and grey colors are the most common. Most of natural slate can be installed on the roofs with 4:12 or greater pitch. The whole structure of a house should be adequately built to support heavy weight slate tile. Clay tile could be heavier than slate, and some houses not even designed for heavy clay tile roof installation. Minimum requirements to the roof pitch vary and depend on tile type, style, and design. Some clay tile can be installed on the roofs with 3:12 minimum pitch while others required 6:12 or greater pitch. With proper installation easily withstand 110 mph wind. Excellent resistance to strong wind. Potentially any type of roof can be damaged by huge in diameter hail, but slate has an excellent impact resistance. Flat clay tile has very high resistance to impact. High profile tiles can be damaged by big hail, but still it is one of the most impact resistant roofing materials. Natural slate does not burn. Clay tile is non-combustible material. Excellent resistance to severe weather. Correctly installed quality clay tile has high resistance to snow and ice. Inadequate slate maintenance can lead to moos accumulation on roof surface. Fairly moss resistant roofing material. Natural slate is extremely hard roofing material and one of the most durable products on the market. Clay tile is hard enough to withstand any weather conditions with excellent durability qualities. Slate can easily brake under the feet. Clay tile is not walkable type of roofing materials. Slate can easy last for over 70 years, but nails and fasteners might not last that long. 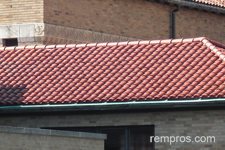 Normally over 75 years, but lifespan depends not only on clay tiles quality, but proper installation as well. Using premium fasteners, stainless steel or hot-dipped galvanized nail, which do not rust in combination with adequate installation technique will ensure long lasting tile roof performance. Maintenance typically includes cleaning of any debris from slate and checking for any broken tiles which has to be replaced immediately. Clay tile roof should be clean and flowing water must be freely drained from roof surface. Roof should be checked for any broken, loose or damaged tiles and if any prompted replacement is essentially important. Significantly vary, some manufacturers offer limited lifetime warranty on the slate roof professionally installed. Manufacturer warranty which normally covers defects of clay tile during production might range from 35 to 50+ years. Roofing contractor typically issues installation warranty which often vary from 1 to 2 years and cover any post installation problems with a roof caused by poor completed work. Boxes different dimensions. Many slate roof tiles are 16 inches (40 centimeters) long and 10 in. (25 cm.) or 8 in. (20 cm.) wide. Different sizes boxes. Clay roofing tiles manufactured in wide range of widths, lengths, and thicknesses. Depends on slate thickness. Typically 1/4” – 3/8” thick natural slate roof weight about 1050 – 1200 lbs/per square or 51 – 58 kg/m2. Clay tile is heavy weight roofing material and each square of tile roof weigh 900 – 1100 pounds (408 – 499 kilograms). Natural slate is one of the most expensive roofing materials to purchase. Greatly vary, but clay roofing tile is an expensive material. 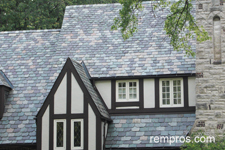 Cost of slate roof installation is high. Clay tile roof installation is an extremely costly project. Slate roof installation is a difficult task. Installation of clay tile roof is not a do it yourself project. Installation of 35 squares of natural slate tiles on medium slope gable roof is 5 – 8 days project for a crew of 7. Crew of seven normally is able to install 40 squares of clay tile roof in 6 to 9 days. It could be an extremely hard task to repair clay tile roof. Only one layer of natural slate tiles can be installed on the roof. A single layer of clay roofing tiles can be installed on adequately built roof structure. Normally problems with quality natural slate roof occur because of poor installation or inadequate maintenance. Nails or fasteners failures, improper installed flashing, leaking in valleys. Natural slate and clay tile are premium roofing materials which can easily last 3 – 4 times longer compare to asphalt shingles. Slate and clay tiles roofs are extremely expensive to install and required higher maintenance. In addition, both roofs should be professionally installed and even handy homeowners often unable to perform such project adequately.